Graphic via our media partners at CBS-19 The Newsplex : As of late Wednesday afternoon the estimates for a very significant snowfall are very good. Above shows the thinking of Meteorologist David at The Newsplex. As of 7PM Wednesday evening, indications still are on track for a major winter storm. Above, the map Meteorologist David Reese over at CBS-19 prepared late afternoon Wednesday. David posted in his Facebook update late Wednesday afternoon. 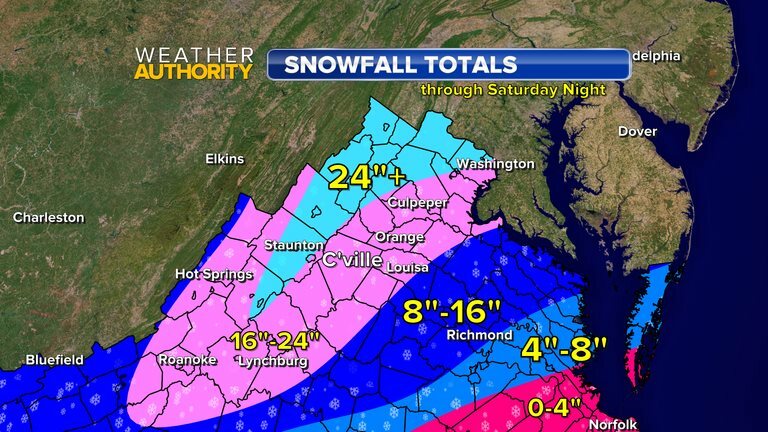 As I have been talking about for days, the prospects of a major winter storm continue to develop here in the Blue Ridge. The timing for the event looks to be late night Thursday into Friday (the heaviest of snow) and then tapering off on Saturday. heavy snow with high winds. The “worst” model really does say “40-inches”. WPOA and the Resort are staging heavy equipment to assist with keeping our roads clear,” Wintergreen Fire and Rescue Chief Curtis Sheets tells BRL. “We are working with all agencies in preparation for the approaching storm. Later today we will have additional conference calls and briefings from the National Weather Service,” Nelson County Emergency Services Director Jaime Miller.